It’s December 1914 and Poppy Pearson moves from working as a parlour maid for the wealthy De Vere family to train as a Voluntary Aid Detachment (VAD) nurse. Leaving service, Poppy doesn’t really expect to see any of the family she worked for again, especially not their younger son Freddie, with whom she’s had a mild, innocent flirtation. But who knows what could happen in these times? The world is changing and so are Poppy’s chances to make something of her dreams. 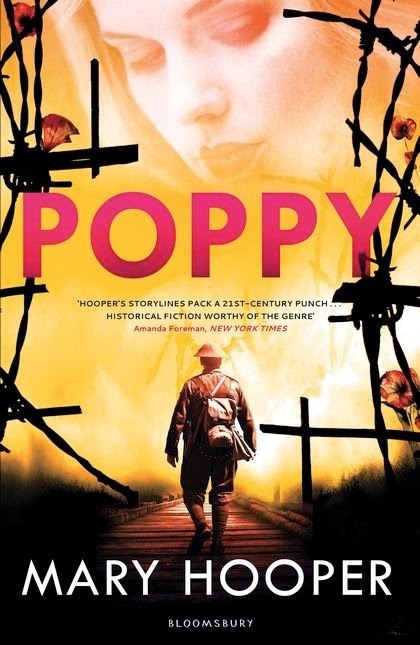 Training doesn’t prepare Poppy for the reality of war though, and she is shocked by her first encounter with wounded soldiers on a hospital train. However, she stands firm in her determination to contribute to the war effort and soon finds herself assisting with dressings, scrubbing lockers, distributing meals, making beds, writing letters, and comforting the soldiers. This story doesn’t pull any punches. Men with horrific injuries, shell shock, self-inflicted injuries, and prisoners of war are all discussed with honesty. Mary Hooper is an expert at recreating times past, and you will feel immersed in the experience of nursing the soldiers, and emotionally affected by all the characters. As Poppy ends, on Christmas Day 1915, Poppy makes a sudden, momentous decision. It’s one that will play out in the forthcoming sequel, Poppies in the Field.